According to Mac Otakara, which provided the photo of the so-called "feature bay" seen above, Apple Stores are rolling out the new design to throw a spotlight on accessory use cases, not simply the devices they support. It is unclear when other stores are scheduled to get similar treatment. For now it seems Apple is concentrating on iPhone photography, the most touted feature of the company's biggest revenue driver. 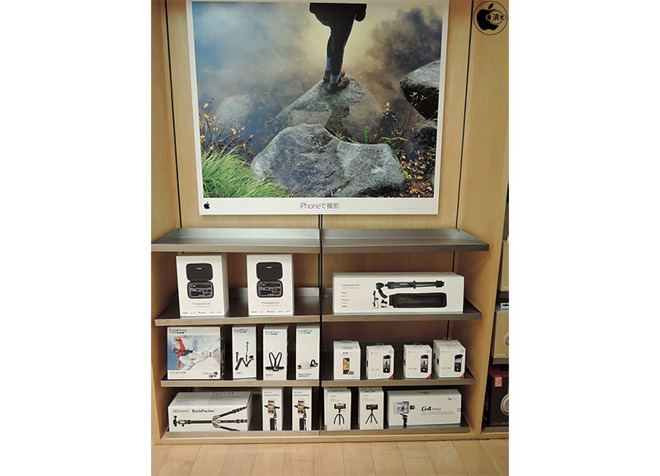 The feature bay shown above includes an assembly of products including a "Photography Kit," a "Videography Kit," multiple GoPro items beneath a poster of shot on iPhone. Perhaps not coincidentally, Apple started advertising some of these accessory kits on its website earlier today. The reimagined Apple Store layout comes just days after Apple SVP of Retail Angela Ahrendts spoke about the future of Apple retail, both online and in brick-and-mortar outlets. Ahrendts said she envisions a store with products arranged by use case, singling out photography and gaming as specific examples, suggesting a "feature bay" advertising gaming accessories could be in the offing.